My Review: So I don’t post on here about liquor (be it by itself or as cocktails) nearly enough, which is funny, because while I do drink a great deal of wine, I also drink a great deal of liquor (and beer, but that’s not what we’re talking about right now). My prefered alcohol is whisky (yes, I spell it without the “e”), usually in the form of Bourbon or Rye. 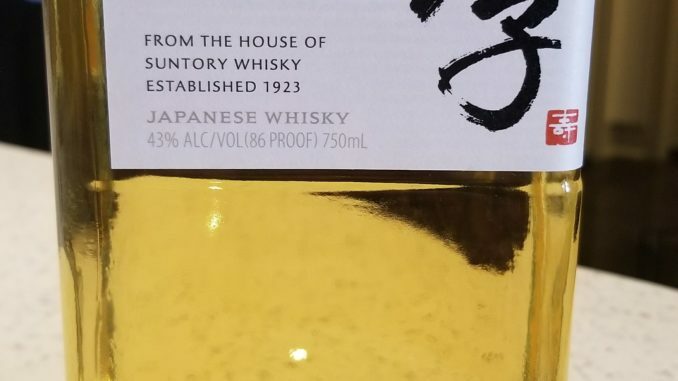 That being said, I was recently inspired to branch outside my comfort zone and picked up a bottle Japanese Whisky – Suntory Toki to be exact, as I had heard good things from blogs, magazines, bartenders, and friends. I have to admit, it wasn’t what I expected. In the glass the whisky was a light gold color, and on the nose I picked up some herbaceous notes. What really caught me off-guard, however, was how it showed on the palate. Now I preface this by reiterating that I mostly drink bourbon and rye, because I want you to understand where I’m coming from when I say this, but it reminded me so much of scotch whisky that I double checked the bottle. Yes, I know that Scotch can only come from Scotland, but the light body, the spice, the oak, and the bit of pepper on the finish reminded me of some Highlands Scotch like I used to drink. This isn’t an indictment – I enjoy scotch, but have moved away from drinking it on the regular in part because of the costs of getting good scotch versus other whiskies, but if you’d blindfolded me and let me taste this, I’m not sure that I wouldn’t’ have picked it as being scotch as opposed to another type of whisky. Now, when I buy whisky, I buy it for one of two reasons – to sip on (usually with about 3 cubes of ice), or to make cocktails with. This definitely falls into the former category. While I’ve read about a new trend of making cocktails with Japanese whiskey (I’m assuming because of the unique flavour profile), I don’t know what I would want to do with this that I wouldn’t do with scotch. That being said, it’s a much more affordable way to make scotch-based cocktails than what I would usually drink in scotch…so there is that. It really comes down to whether or not I would buy it again, and when it comes to the Suntory Whisky Toki…I honestly don’t know. Not because I found it unpalatable, but because I did enjoy it (and I did like it), I’d be inclined to spend a bit more money and try different Japanese whisky. I guess that’s an endorsement of the bottle.